The Uber driver accused in a deadly weekend shooting spree in Kalamazoo, Mich., confessed to “taking people's lives” after he was arrested, a detective testified in court Monday. Authorities say six people were killed and two wounded when Jason Brian Dalton, 45, randomly fired on apparent strangers from a black Chevrolet HHR over the course of nearly five hours Saturday evening. Dalton was taken into custody after officers spotted him driving away from a bar parking lot after midnight Sunday. Dalton, a married father of two children with no apparent criminal record, slouched and appeared somber during his first court appearance Monday. He indicated he understood the 16 charges — including six counts of murder, two of attempted murder and eight felony gun counts — against him. “I would prefer to just remain silent,” Dalton replied when Judge Christopher Haenicke asked him if he had anything to say. But Kalamazoo County prosecutor Jeff Getting says Dalton waived his right against self-incrimination and admitted his involvement in the shooting spree. 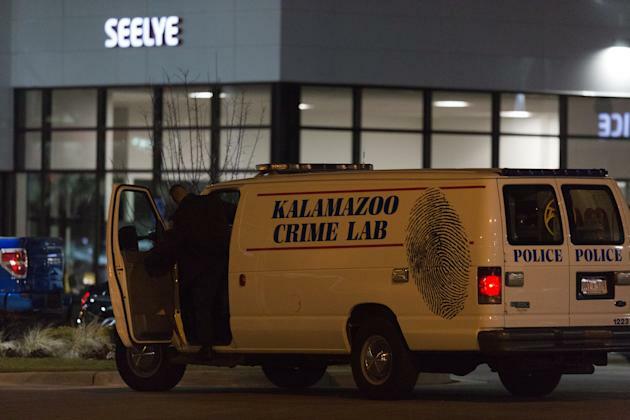 Kalamazoo police detective Cory Ghiringhelli provided details of the confession to a judge early Monday, Michigan Live reported. “Dalton ultimately told detectives under Miranda that he took people’s lives on 2/20/2016,” Ghiringhelli told District Judge Anne E. Blatchford. Neighbors told reporters that Dalton was an insurance adjuster. Dalton’s Facebook page indicates he was a former high school wrestler, has been married for 20 years and enjoys refurbishing classic cars. On Monday, his family vowed to help authorities determine a motive for the attack. Judge Haenicke denied Dalton bail and scheduled a preliminary hearing for next week. He has requested a court-appointed attorney. The shootings occurred outside an apartment complex, in a restaurant parking lot and at a car lot. Two victims remain hospitalized. The victims range in age from 14 to 74. Dalton’s statements to police were used to file the charges of murder and attempted murder Monday, two days after six people died in random shootings in the Kalamazoo area. One 14-year-old victim was initially declared brain dead but clings to life. The criminal charges filed against Kalamazoo Uber driver Jason Dalton. Click image to read full document. Uber, the online transportation service that dispatches drivers using their own cars, said it is cooperating with the investigation, the AP reported. Uber passenger Matt Mellen says he called police to report that Dalton was driving erratically more than an hour before the shootings started. Uber says it received complaints about Dalton from several passengers, including one about erratic driving. But the company won't say whether it talked to Dalton and is referring further questions to law enforcement. The ride-hailing service says Dalton cleared a background check and was approved to be a driver on Jan. 25. He had given slightly more than 100 rides. Jason Sickles is a national reporter for Yahoo News. Follow him on Twitter (@jasonsickles).